Informational PagesSo What About Ticks? 1. 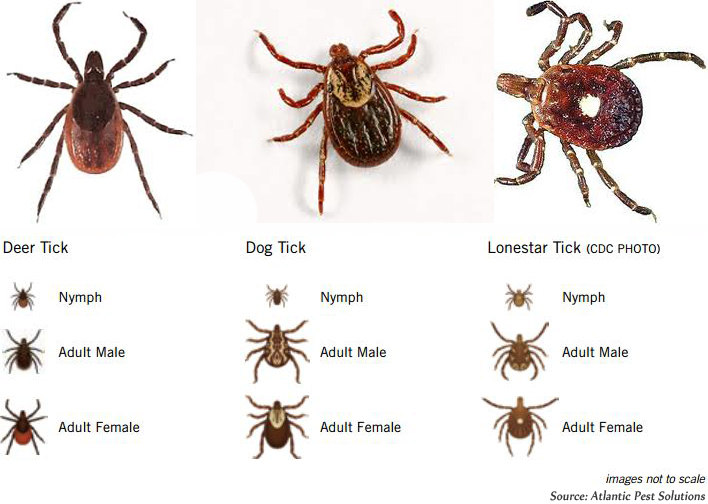 All ticks come in small, medium and large sizes. Ticks have four main life stages: eggs (the smallest size), larvae (equivalent to a grain of sand), nymphs (the medium size, about the size of a poppy seed) and adults (the largest size, about the size of an apple seed). 3. Cold and snowy? No big deal. Yup, winter doesn’t bother certain tick species. In fact, adult stage deer ticks become active every year after the first frost. While some ticks go dormant, deer ticks will be active any winter day that the ground is not snowcovered or frozen. This surprises people, especially during a January thaw or early spring day. 4. Ticks carry disease-causing microbes. Tick-transmitted infections are more common these days than in past decades. With explosive increases in deer populations, the trend is increasing abundance and geographic spread of deer ticks and lone star ticks; and scientists are finding an ever-increasing list of disease-causing microbes transmitted by these ticks. Tick bites used to be an annoyance, but now a bite is much more likely to make you sick. 5. If you (or your dog, cat or horse) are bitten, you probably won’t know it. This is super creepy, but tick bites are painless (ticks’ saliva has anesthetic properties) and hosts generally don’t feel it. What’s worse: fewer than half of people who’ve been infected with Lyme disease show the “bull’s-eye rash” that was once thought to be a telltale sign of the disease. If you start showing flu-like symptoms in the middle of summer (fever, chills, aches, and pains are common symptoms of a variety of tick-borne diseases), go to the doctor and ask to be tested for the illnesses associated with ticks. This is also why it’s essential to keep a close eye on your pet and check for ticks after he or she spends time outdoors. 6. The easiest way to remove a tick is with pointed tweezers. Think of a tick as a little germ-filled balloon. Squeeze it too hard on its back end, and all the germs get pushed to the front end. Using really pointy tweezers, it’s possible to grab even the poppy-seed sized nymphs right down next to the skin. The next step is to simply pull the tick out like a splinter. Other tick removal methods, like a hot match, Vaseline, dish soap and cotton, or various little key-like devices don’t work, so don’t bother trying. And your safest bet is going to a doctor or veterinarian for removal. 7. Tick bites and tick-borne diseases are 100% preventable. There’s really only one way to become infected with a tick-transmitted disease, and that’s from a tick bite. Taking steps to protect yourself (with tick-repellent clothing or spraying tick repellent on clothing) and your pets (with year-round preventive medication and regular tick checks) especially if you spend any time outdoors will drastically reduce your risk of developing tick-borne diseases. Remember, just one bite is all it takes to make you or your pet sick—so prevention is your best bet. 1. Anaplasmosis is transmitted to humans by tick bites primarily from the blacklegged tick in the northeastern and upper midwestern U.S. and the Western blacklegged tick along the Pacific coast. 2. Babesiosis is caused by microscopic parasites that infect red blood cells. Most human cases of babesiosis in the U.S. are caused by Babesia microti. Babesia microti is transmitted by the blacklegged tick and is found primarily in the northeast and upper Midwest. Babesiosis is caused by microscopic parasites that infect red blood cells. Most human cases of babesiosis in the U.S. are caused by Babesia microti. Babesia microti is transmitted by the blacklegged tick and is found primarily in the northeast and upper Midwest. 3. Borrelia miyamotoi infection has recently been described as a cause of illness in the U.S. It is transmitted by the blacklegged tick and has a range similar to that of Lyme disease. 4. Colorado tick fever is caused by a virus transmitted by the Rocky Mountain wood tick. It occurs in the Rocky Mountain states at elevations of 4,000 to 10,500 feet. 5. 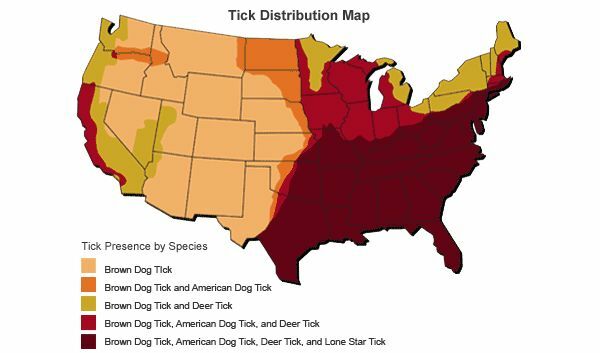 Ehrlichiosis is transmitted to humans by the lone star tick, found primarily in the south-central and eastern U.S.
6. Heartland virus infection has been identified in eight human patients in Missouri and Tennessee as of March 2014. Studies suggest that lone star ticks may transmit the virus. It is unknown if the virus may be found in other areas of the U.S.
7. Lyme disease is transmitted by the blacklegged tick in the northeastern U.S. and upper midwestern U.S. and the Western blacklegged tick along the Pacific coast. 8. Powassan disease is transmitted by the blacklegged tick and the groundhog tick. Cases have been reported primarily from northeastern states and the Great Lakes region. 9. Rocky Mountain spotted fever (RMSF) is transmitted by the American dog tick, Rocky Mountain wood tick, and the brown dog tick in the U.S. The brown dog tick and other tick species are associated with RMSF in Central and South America. 10. Rickettsia parkeri rickettsiosis is transmitted to humans by the Gulf Coast tick. 11. Tickborne relapsing fever (TBRF) is transmitted to humans through the bite of infected soft ticks. TBRF has been reported in 15 states: Arizona, California, Colorado, Idaho, Kansas, Montana, Nevada, New Mexico, Ohio, Oklahoma, Oregon, Texas, Utah, Washington, and Wyoming and is associated with sleeping in rustic cabins and vacation homes. 12. STARI (Southern tick-associated rash illness) is transmitted via bites from the lone star tick found in the southeastern and eastern U.S.
13. Tularemia is transmitted to humans by the dog tick, the wood tick and the lone star tick. Tularemia occurs throughout the U.S.
14. Rickettsiosis is transmitted to humans by the Pacifi c Coast tick. This is a new disease that has been found in California.